Textured T/C White Line Paint is a 100% acrylic emulsion paint fortified with fine sand to provide a texture similar to that of the playing surface. 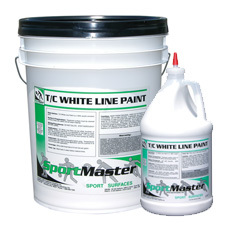 SportMaster tennis court line paint can also be used for many other game courts and recreational playing surfaces. 100% acrylic emulsion paint with sand added. Textured T/C White Line Paint is a 100% acrylic emulsion paint fortified with fine sand to provide a texture similar to that of the playing surface. Pavement surface must be cleaned entirely of dust, dirt, debris and all loose material. If using T/C Textured White Line Paint on a new, uncoated surface, allow adequate curing time before application. Allow each coat of material to dry thoroughly before applying successive coats. Allow final coat to dry 48 hours before opening up for play. View in Catalog 1 gal. Jug 13 lbs. 5 gal. Pail 65 lbs.